We all love a good donut, but did you know that donuts made a powerful contribution to World War II? During the war, the American Red Cross sent thousands of American women to Europe to cheer the homesick troops with conversation, entertainment, and you guessed it, donuts. As the U.S. became involved in World War II, leaders knew it was important to keep the soldiers’ morale up. Permanent hotels and clubs were opened in London. Soldiers could visit these places during their leave (time off) for rest and relaxation. But not every service member could get to London. Military leaders didn’t want the soldiers overwhelming British communities or causing disciplinary problems. They decided to create mobile clubs that could go to the smaller communities. In 1941, the Red Cross began recruiting young women to travel to England and Europe to serve as “donut dollies.” The women had to meet very high standards. They must be at least 25 years of age, have a college education, pass a physical exam, and have a pleasing personality. They needed to be intelligent, charming, and sensible. Only 1 in 6 women passed. These women went as volunteers. They weren’t paid a cent for their work. After several weeks of training in Washington D.C., the women were sent to England. Here they worked in English buses that had been converted to mobile clubs. The buses had donut and coffee making machines on board and a small lounge in the back of the bus where the men could sit and talk. A record player and loudspeaker played music and a concession stand provided gum, cigarettes, magazines, and newspapers. The donut machines could whip out 48 dozen donuts in an hour, but that wasn’t enough. The Red Cross built a large, permanent bakery and sent donuts out to the mobile clubs. When the troops invaded Normandy, the donut dollies followed. Three women worked together in one bus. They stayed at the rear of the troops or went into nearby towns. The women drove the buses, fixed them when they broke down, and continued making donuts. Question: How many donuts did the women serve? Answer: A lot. 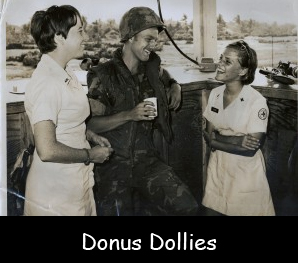 The donut dollies became a symbol of good cheer for the soldiers. In December, 1944 alone, over 4 million donuts were served. Watch a video about a donut dolly from the Vietnam War. Declan, Tobin. " Facts about Donut Dollies During Wartimes ." Easy Science for Kids, Apr 2019. Web. 25 Apr 2019. < https://easyscienceforkids.com/donut-dollies/ >.